The classic Canadian dish will be the guest of honour during the first-ever Cornwall Poutine Feast, a four-day festival set for the Victoria Day long weekend (May 18th to 21st) in beautiful Lamoureux Park. The new event will feature approximately 10 poutine vendors from near and far serving up traditional poutiness along with out-of-this-world poutine creations. Think bacon double cheeseburger poutine, philly steak poutine, onion ring poutine, and so on. The free admission festival will also feature other food and drink vendors and activities scattered throughout the park along with a full line-up of live entertainment and a beer tent. But the highlight, of course, will be the beautiful culinary creation of french fries smothered in gravy and fresh curds. The gourmet poutines on offer will be sure to impress festivalgoers. As one example, Fat Les’ bacon double cheeseburger poutine has won top honours at a Montreal poutine festival in 2015 and again in Ottawa in 2017. “It (the bacon double cheeseburger poutine) weighs three pounds,” he said with a laugh. With the timing of the long weekend and a beautiful waterfront park as a setting, Mr. Winters is hoping the event will draw thousands of attendees from both near and far. The hope is to build it into annual event that grows year after year. “Cornwall people are awesome, they always come out and support the festivals,” he added. 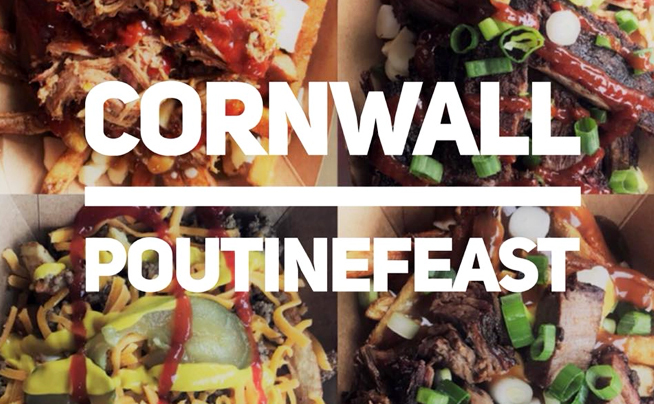 For additional information and updates, make sure to follow the Cornwall Poutine Feast Facebook event page. Planning a visit to Cornwall? Cornwall Tourism can help. Email us at info@cornwalltourism.com to request a copy of our Visitor Guide or contact us at (613) 933-0074. You can also stop by our Visitor Information Centre at 100 Water Street East (inside the Civic Complex).